The first robotic dispensing system is now operating in Bahrain with the aim of making going to the pharmacy painless,fast and fun. At Farmacia by Yara, two pharmacists command the German-imported robot which can store up to 16,560 different types of medication and can dispense prescriptions in just four seconds. The pharmacy is located in Budaiya’s Garden Plaza inside Hospitalia by Yara medical centre which offers several services including dermatology, hyperbaric oxygen chamber, plastic surgery, aesthetics, dentistry, general practice and the kingdom’s first unisex CryoTherapyfacilities. Similar systems have been successfully introduced by some global innovating providers and it was a concept beauty,health and wellness entrepreneur Yara Jameel Salman, was convinced would be welcomed in the kingdom. Jayne Green, the hospital’s customer relations manager, said: “Yara is always proactive in researching the latest innovative technology to bring to Bahrain to make her concept of ‘where medical meets luxury’ a reality. “Farmacia caters for all family medical needs and also offers a wide range of niche products for skincare. This is not your typical pharmacy. 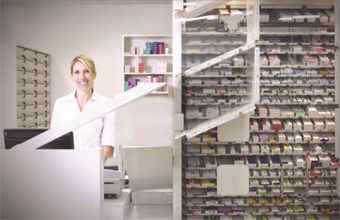 In a standard pharmacy the experience often starts with a doctor supplying a prescription and a hospital administrator scanning it to the pharmacist. The pharmacist then types the prescription into a computer, a technician fills out the order, the pharmacist then checks forthe correct medicine and a nurse gives out the medication to the patient. This procedure can take between 10 to 20minutes, if there are no queues. However, with the automated process, a pharmacist simply has to type the medicine into the system and a robot will retrieve it. The automated process is considered byadvocates as not only efficient but helpful for some patients who would much rather spend their time recovering back home as soon as possible rather than hanging about for their medicine. The machine also includes a function allowing for several packages to be dispensed at the same time. This robotic trend has grown in popularity around the world and according to an international report made by consulting and advisory firm Grand View Research, the global pharmacy automation devices market is growing at a substantial rate. The devices referenced in the report include medication dispensing system, packaging and labeling systems, storageand retrieval systems, compounding systems and tabletop counters–all of which are being implemented to increase efficiency of work within pharmacies.